Rookery North course superintendent Mark Nauman, left, and staffer Carl Owens stand in front of a large wood chipper. They are busy with a major tree removal/trimming project this winter, and the changes to the course are impressive. In golf, there are two kinds of chippers. One is a specially designed club for folks who need extra help with shots from just off the green. The other is a big honking piece of dangerous machinery that takes in whole branches and spits out a pile of mulch on the other end. You are far more likely to see the first kind than the second out on a golf course, but the second one is actually far more important. While you can always chip with a wedge or short iron, sometimes you need the other kind of chipper to keep your golf course playable for as many golfers as possible. 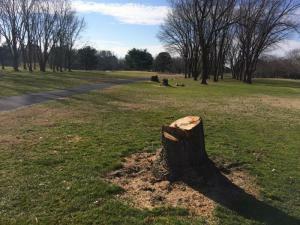 In the last few weeks, course superintendent Mark Nauman, staffer Carl Owens and others have been using a Bandit Intimidator wood chipper while removing trees and branches from the Rookery North golf course. The results of their efforts are already impressive, and they plan to expand on what they’ve accomplished thus far during the off-season. “So far we’ve taken out 30 trees completely, and trimmed off at least a dozen more,” Nauman said in a recent interview. The most visually stunning changes thus far are at the long par 3 10thhole, where tall oaks and maples crowded in from the right and left sides of the approach. If your tee shots were draws or hooks, either high or low, it was nearly impossible to reach the green. The canopies of the large trees blocked the way, and often knocked down what had looked like promising shots. Six of those trees are gone, and their absence created a different perspective from the tee box. As co-owner Chris Adkins and Nauman both said, the green from 197 yards away looks farther away than it did before. Perhaps those trees collapsed the visual perspective. The 10th is still one of the hardest par three holes in Sussex County, but cutting down those trees gave more golfers a fighting chance to make par. Other tree removals also made a lot of sense from both playability and turf health perspectives. On the left side of the first green, two trees that stood on the inside of the cart path were cut down. Several branches that previously hung over the left greenside bunker were also trimmed from the trees that remain. Nauman said, “We’ll grind out [the stumps] and put in topsoil. We’ll probably also put in some sod.” Those trees inhibited turf growth left of the first green, which should not be an issue any longer. At the blue tee box location for the second hole, trees were removed that caused similar turf issues. Two other trees left of the white tee box for that hole were also cut down, making tee shots from the blues a bit easier for those who fade their drives. In the woods along the left side of the second fairway, several high mounds of wood chips looked like giant chocolate drops. One of the pine trees that stood behind the par 3 fourth hole is now just a stump to be ground away. That should help golfers recover from tee shots that bounce past the green. 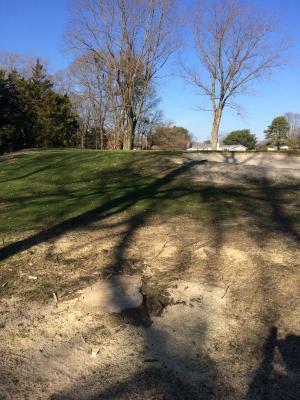 Several trees were removed behind the seventh tee, again with the goal of eliminating the competition for light and air that the turf always lost. Five pine trees adjacent to the right-side fairway bunker on that hole are also gone, in a spot where there always appeared to be more pine needles than grass. Four trees adjacent to the little creek that separates the tee boxes on the par 3 13th have been marked for removal. These trees can make this hole feel like a dogleg left when hitting from the back tees, which isn’t supposed to happen on a par 3. The 18th hole at Rookery North is a 431-yard par 4. It is actually the hardest hole on the golf course from the white or blue tees. A long series of trees stands sentry on the left and right sides of the fairway, and present a significant challenge to golfers whose tee shots drift to the right. The overhanging branches on some of these trees block otherwise routine long iron or hybrid approaches to the green from the right-side fairway. That problem was addressed by removing several large branches from two trees that stand about 90 and 75 yards from the green on that side. Approach shots from 150-200 yards out will still be very challenging, but won’t be quite so intimidating. Nauman said they are also doing some much-needed bunker repairs, including replacing the drainage systems and adding new sand. “I think we’ll get to about a half-dozen or so this winter with the new drains. All of the bunkers are getting new sand,” Nauman said. Adkins was clearly a little wistful at the loss of some of these trees, several of which were planted when the first nine holes were built 60 years ago. However, he knows that while many golfers like to see trees, they play their game on grass. Byline: Thank you to Fritz Schranck who has been writing about the Cape Region's golf community since 1999. Snippets, stories and anecdotes from his columns are included in his new book, "Hole By Hole: Golf Stories from Delaware's Cape Region and Beyond," which is available at the Cape Gazette offices, Browseabout Books in Rehoboth Beach, Biblion Books in Lewes, and local golf courses. His columns and book reviews are available at HoleByHole.com.